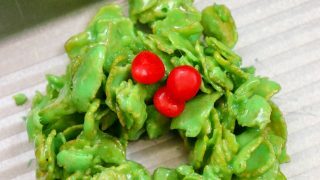 Christmas Wreath Cookies are a fun recipe for the holidays. The holiday cookies are easy to make, with marshmallows, food coloring, and Corn Flakes. The kids love helping make and eat the special treats. 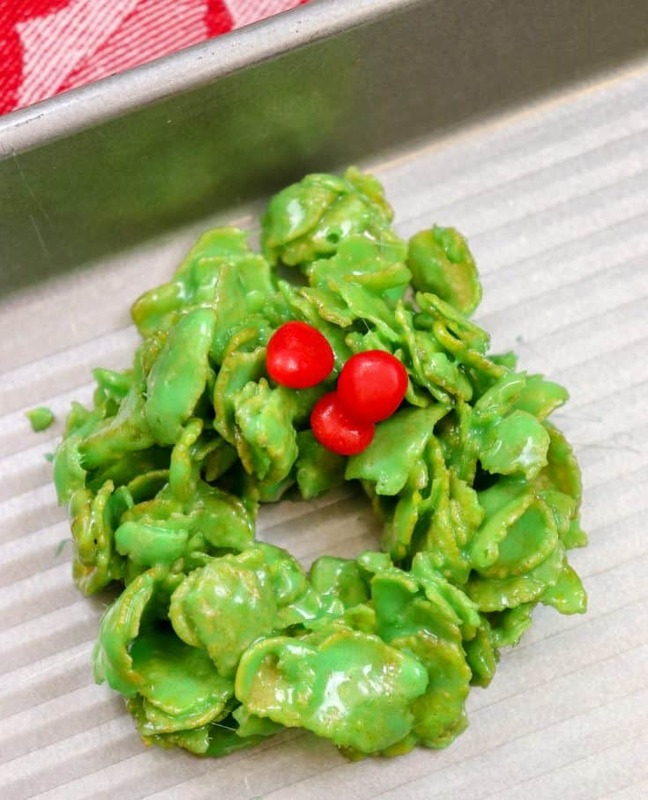 I always loved Christmas Wreath Cookies as a kid. 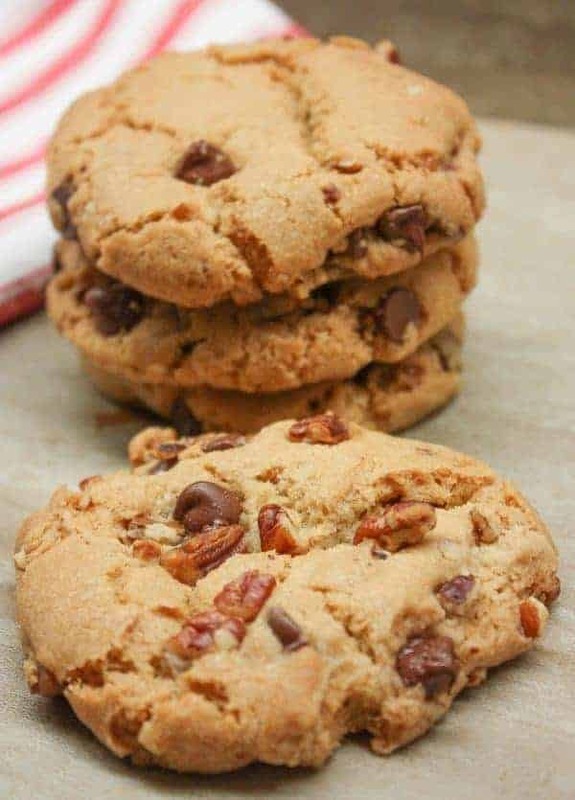 The Christmas cookies were always a favorite and I would get so excited if my mom made them or if I came across them at a party. 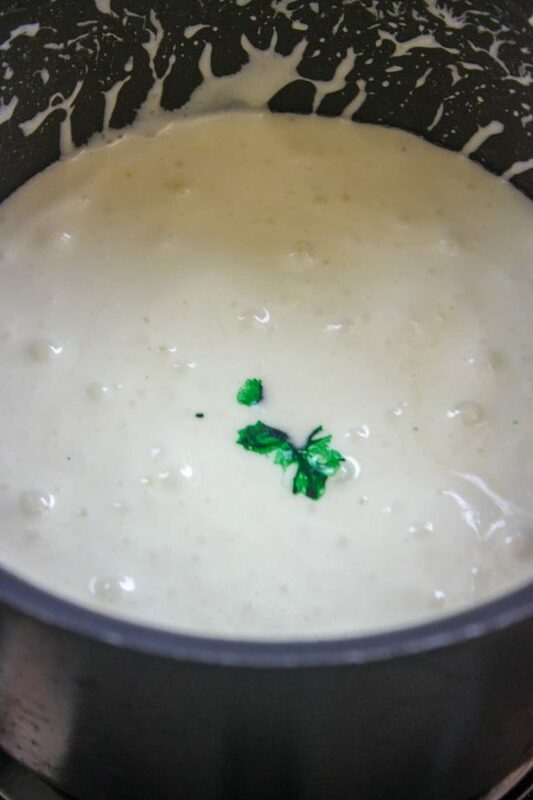 The recipe is simple and costs less than ten dollars. You will only need four ingredients (five if you’re counting the red hot candies for garnishment). And, get the kids involved! You know they love helping make cookies. 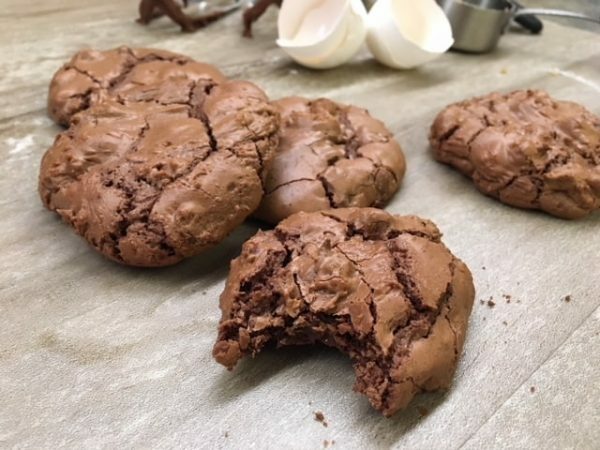 How do you make the easy holiday cookies? 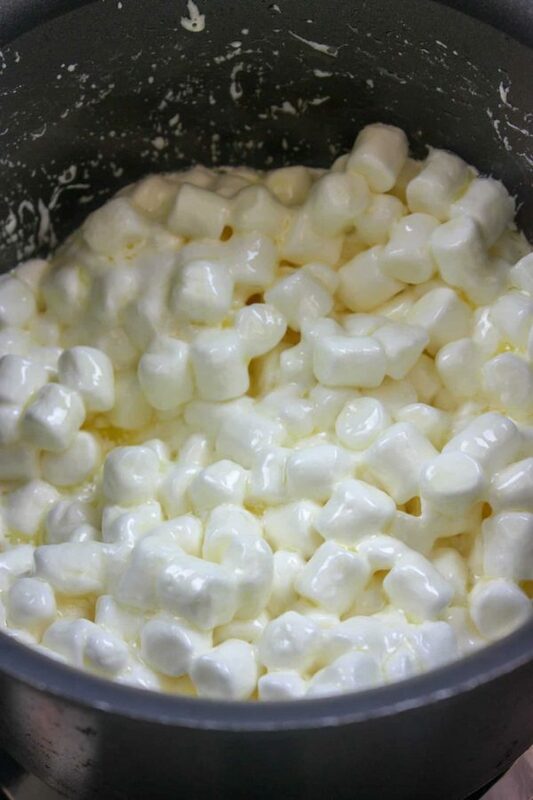 Add the mini marshmallows to the saucepan and stir until they are coated with butter. 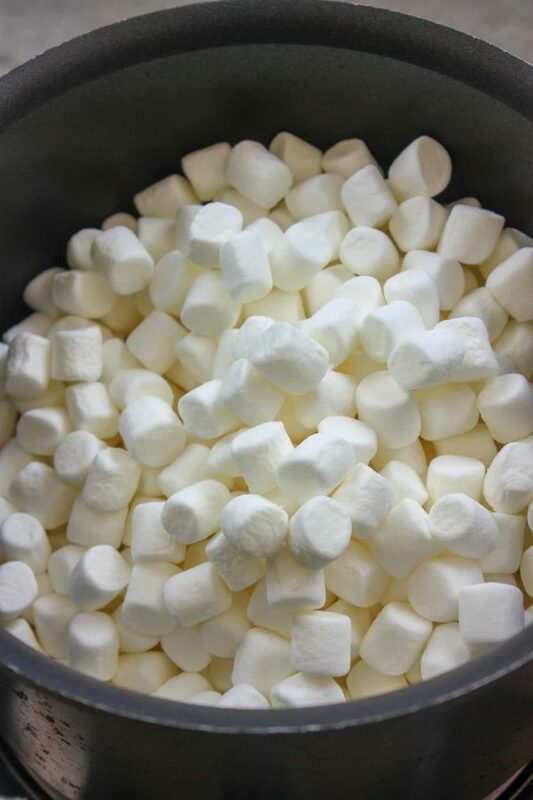 Melt the mini marshmallows on medium to medium-high heat. Stir on occasion to keep them from burning. 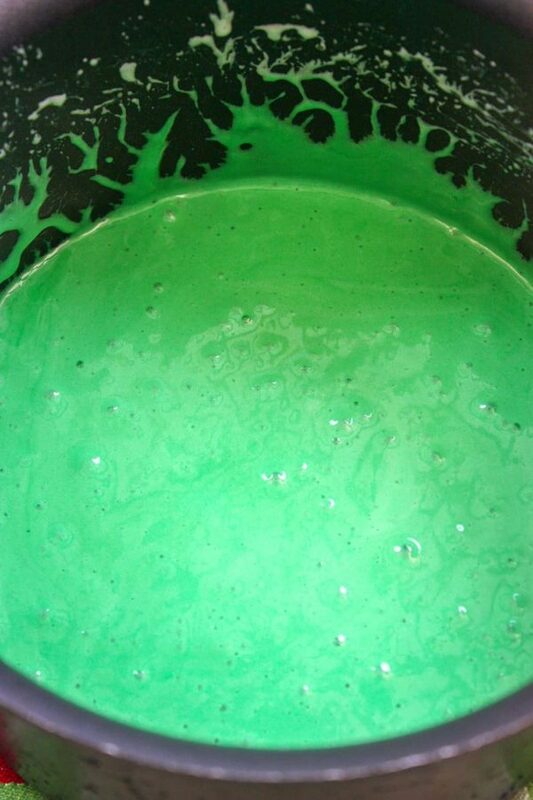 Once the marshmallows are melted, add the green food coloring. I started off with about 10 drops of food coloring but wanted the Christmas Wreath Cookies to be a little darker in color, so I added about ten more drops. You can add as little or as much as you’d like until you reach the color that you want. Stir until the melted marshmallows are totally green. Add the Corn Flakes to a large bowl. Pour the melted marshmallow mixture over the top. 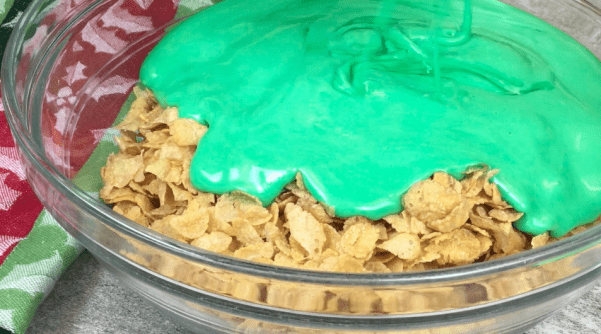 Stir the Corn Flakes until they are completely covered in green marshmallows. Put some butter, non-stick spray, or Crisco on your hands to keep the marshmallows from sticking (and taking over). Shape the cookies into a round shape and then create a hole in the center, until it looks like a wreath. Add the red hot candies to the wreath. You can center them toward the top as I did. I’ve also seen people add them all the way around the wreath. This is where you can let creativity take over. The kids will have a great time adding the candy. It’s a messy job, but it’s a lot of fun. 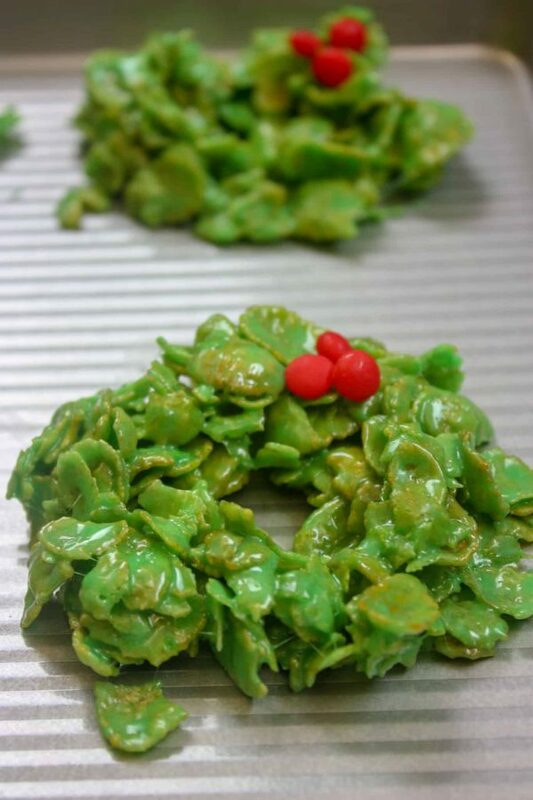 Allow the Christmas Wreath Cookies to set up for about an hour. You can also put them in the fridge if you’re in more of a hurry. 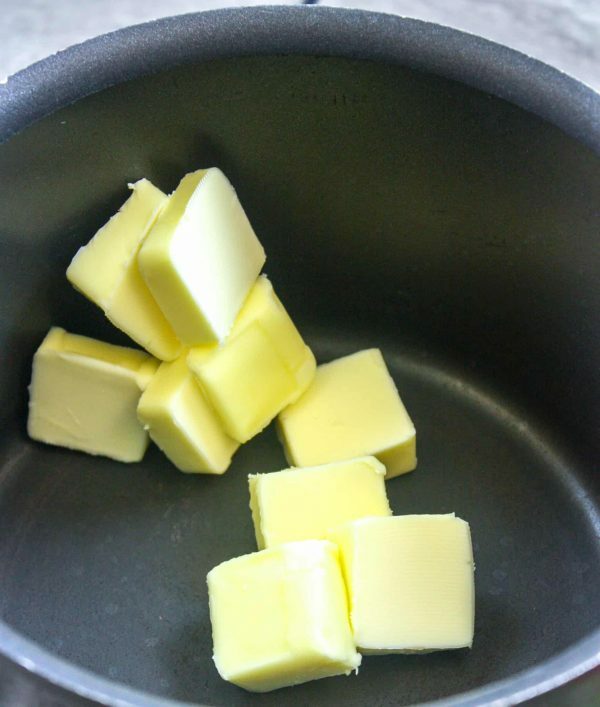 Add the butter to a saucepan and melt on medium to medium-high heat. Add the mini marshmallows and stir to coat with butter. Melt the marshmallows, stirring on occasion. Remove from heat. 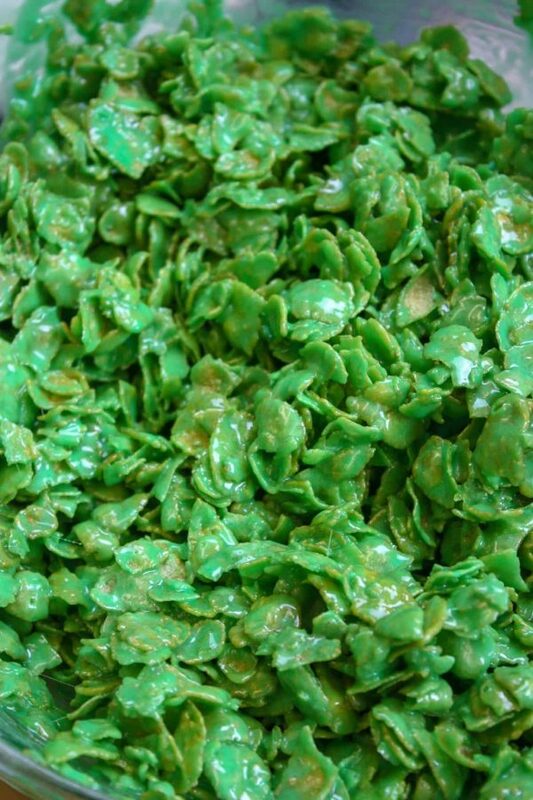 Add the green food coloring until it reaches the desired color. 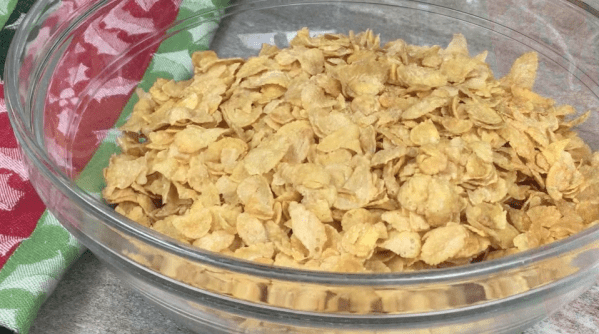 Pour the Corn Flakes into a large bowl. Pour the marshmallow mixture over the Corn Flakes and mix until the Corn Flakes are completely covered. Shape into round circles and create a hole in the center. Decorate with red hot candies. Allow to set up for at least an hour. The food coloring and red hot candies are not included in the nutritional information.